At the start of the year, I published a post on my plan for 2014. 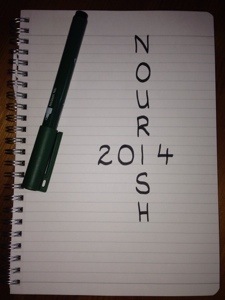 While I didn’t specify my list of goals, I shared that my word for 2014 “Nourish”. In September, I wrote about how I wasn’t getting very far with my list of goals, but that I wasn’t going to let it get me down. But when I wrote our Christmas newsletter, I discovered that we had achieved a lot. I might not have read 50 books this year- as per my goal, but I have read nearly half. Which is significantly more than previous years. I might not have ‘scrapbooked’ 2013 as per my goal, but I have scrapped 15 new pages this year, they’re just not from 2013! I might not have visited 15 new places in Japan, but I have visited at least 15 new places in total this year. I might not have done a course on nutrition, but I have done two Japanese cooking lessons. So I might not have done what I planned to do in 2014, but I have achieved a lot. Our marriage has grown this year, I am happier with how I am parenting, as I feel a lot more patient with the children on the whole and enjoying being a Mum and I am starting to master the never ending task of keeping house. While 2014 hasn’t gone how I planned it to be, it has been a good one on the whole. This entry was posted in Good days, Growing as a person, Somedays and tagged 2014, achieving goals, reviewing goals. Bookmark the permalink.